1. Preheat oven to 160C. Lightly grease six 2/3 cup (160ml) ovenproof dishes and place on an oven tray. 2. Combine the milk, chocolate, butter, chocolate-hazelnut spread and cocoa powder in a small saucepan over low heat. Cook, stirring occasionally, for 5 minutes or until chocolate melts and mixture is smooth. Remove from heat and set aside for 5 minutes to cool slightly. 3. Place the flour, hazelnut meal, caster sugar and 2 tbs of the brown sugar in a large bowl. Add the chocolate mixture and egg and stir to combine. Pour mixture evenly among the prepared dishes. 4. Combine the extra cocoa powder and remaining brown sugar in jug. Add the boiling water and stir to combine. Pour evenly among the dishes, over the batter. Cook in preheated oven for 15-20 minutes or until puddings rise and are just cooked though. Remove from heat. Set aside for 5 minutes to cool slightly. 5. Meanwhile, to make the chocolate sauce, combine the butter, chocolate, chocolate-hazelnut spread and cream in a small saucepan over low heat. Cook, stirring, for 5 minutes or until chocolate and butter melt, and mixture is smooth. 6. 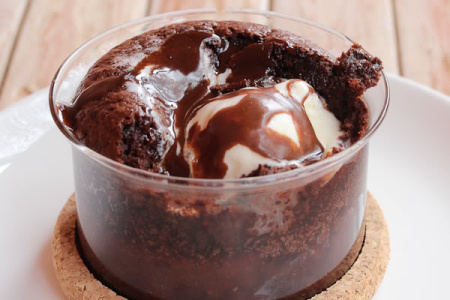 Top the warm puddings with ice-cream or thickened cream and drizzle with hot chocolate sauce. Serve immediately.